SAVING, CHECKPOINTS & TECH SUPPORT: This game incorporates autosave checkpoints. If you only rely on one save slot, you may run into trouble if you get stuck, encounter a bug, or if your autosave becomes corrupted. To avoid problems, I highly recommend changing your save slot in the pause menu at least once per level. 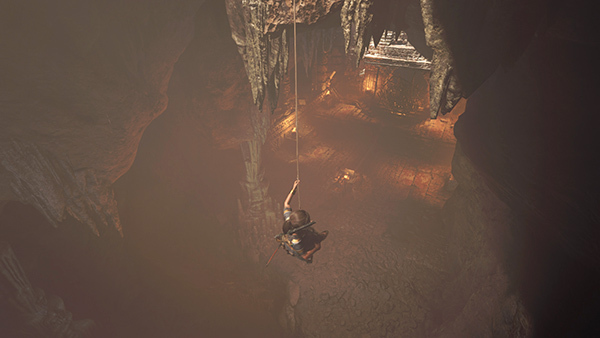 If you encounter a serious bug, I encourage you to visit the Official Shadow of the Tomb Raider Support Forum and or put in a support request with Square Enix. I am working on PC save files for download. Feel free to contact me with special requests. *This camp appears later, after you finish the level, in case you miss the mural and need to go back for it. 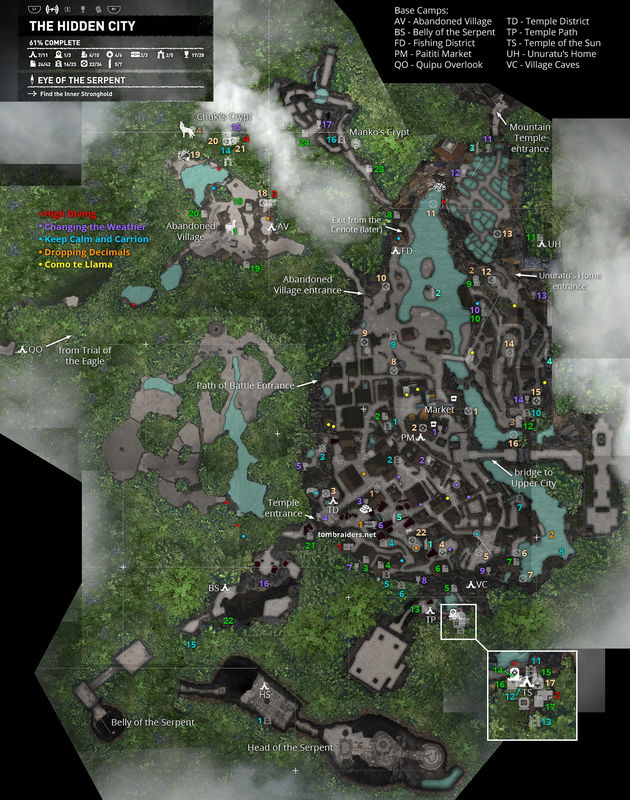 The Belly and Head of the Serpent maps are included at the bottom of the main Hidden City map. HEAD OF THE SERPENT: As you enter the hidden passageway, you receive another XP award, your goal is updated, and Jonah contacts Lara by radio. Another photo, Queen Unuratu, is added to the Artifacts menu, in the Lara's Notebook Story. Examine it to learn more about the Heron and Eclipse family crest and the crisis that led to Unuratu's ouster and the rise of the Cult of Kukulkan. Before tackling the trial, examine the mural (1/1) Awaits (Mam/Homecoming) on the right side of the room. (screenshot) and gather some salvage and other supplies. As Lara steps through the door into a MAP ROOM, the burning oil trickles along the channel, revealing a key in the shape of a silver serpent. Lara takes it and dives into an irrigation channel that whisks her back to the city. She emerges in one of the little pools on the northwest side of the city. Etzli is waiting there, but so are a group of cultist soldiers. 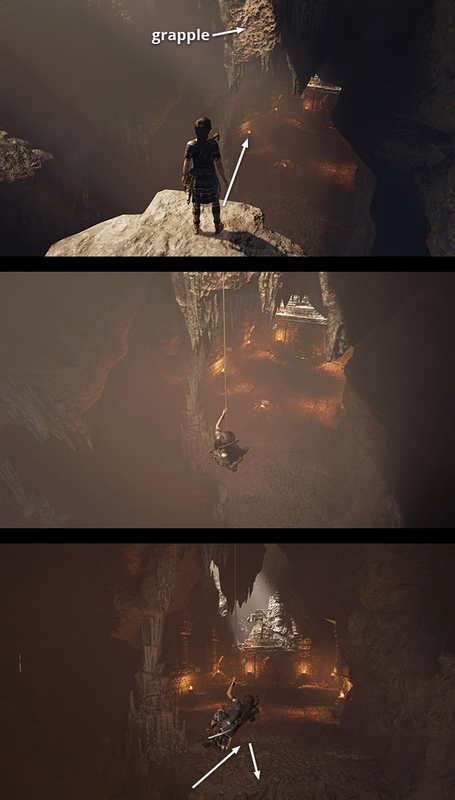 They grab the prince and begin hurling spears at Lara. †UPDATE HISTORY: 10/14/18 - First draft of walkthrough posted online. WAS THIS WALKTHROUGH HELPFUL? If not, I apologize and invite you to contact me with any questions. If you need help right away, I recommend the Lara Croft Online forums (laracroftonline.net), the Square Enix Tomb Raider Forum or any of the other message boards listed at tombraiders.net/stella/community.html. If this site was useful, please consider supporting it financially or in other ways. For details, visit tombraiders.net/stella/support.html. As always, I welcome your corrections/suggestions. Thank you! Copyright © Stellalune (). All rights reserved. Feel free to copy or print this walkthrough for personal use. By all means, share it with friends, but please include this credit line so people can send me their feedback. No part of this walkthrough may be reproduced on another site without permission. Stella's Tomb Raider Site: tombraiders.net.